IdeaWorksCompany releases results from the 6th annual Switchfly Reward Seat Availability Survey. 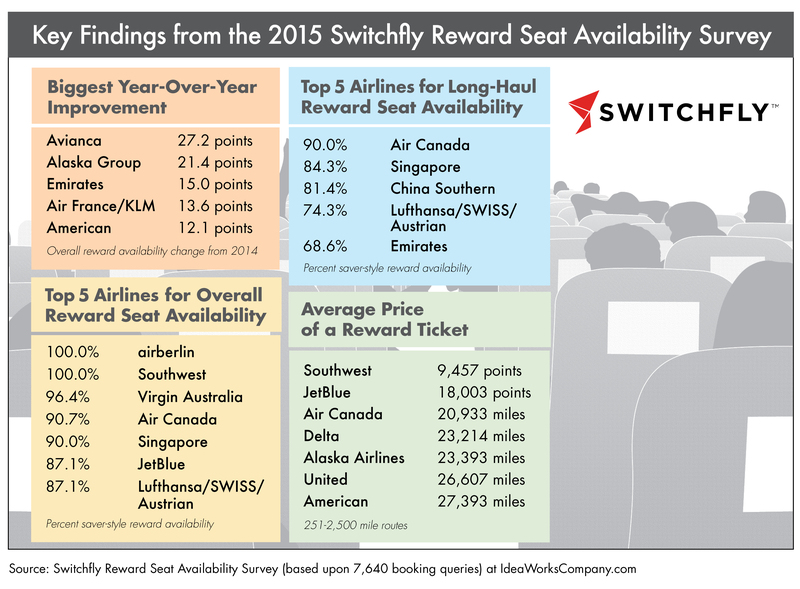 Value-oriented airlines dominate the top tiers of the 6th annual Switchfly Reward Seat Availability Survey. Airberlin, Southwest, and Virgin Australia have placed within the top six in every edition of the reward survey since 2010. But global network carriers Air Canada (and the Aeroplan coalition loyalty program), Lufthansa, and Singapore are now in the top 5. Once again, airberlin and Southwest share first place with outstanding 100% scores; every flight queried in the survey provided reward seats at saver-style levels. IdeaWorksCompany recently reviewed the frequent flier programs of 160 airlines around the world to gather examples of alternative rewards such as unique experiences, event tickets, and retail goods. Beyond the benefit of reducing reward liability, alternative rewards can encourage members to interact more frequently and deeply with the program. In addition, a thoughtful selection of rewards can create a personality for the frequent flier program and ultimately the airline. Does the program wish to be playful, luxurious, or socially aware? Through its review of programs worldwide, IdeaWorksCompany offers examples of 25 alternative rewards ranging from the extravagant to everyday comforts. Michael O’Leary, the CEO of Ryanair, recently admitted “If I had known being nicer to our customers was going to work so well, I would have done it years ago.” As notable as O’Leary’s epiphany is to the airline industry, it’s worth pointing out that the proven value of empathy, competency, and kindness precedes his recent directives to be nice to customers. The latest report from IdeaWorksCompany explores how airline management teams can work together for the greater good of their customers, employees, and investors. Call it a back-to-basics mantra, but sometimes in a technology riddled world, we all can benefit from a few therapeutic reminders to reset our moral compasses. By using the inherently human qualities of empathy, competence, and kindness, the report offers advice to airline management teams to boost ancillary revenue. Buckle up for a global tour featuring network carriers, LCCs, and companies outside the airline industry. IdeaWorksCompany and CarTrawler offer a global a la carte buffet from 20 companies including Aer Lingus, Amazon, American Airlines, Lufthansa, and Tune Hotels The latest IdeaWorksCompany report reviews innovations that rely upon consumer desire for more comfort, convenience, and certainty. A la carte places consumers in control of the travel process. The companies featured in this report know that when a service provides good retail value consumers will click to buy it. Airline ancillary revenue projected to be $49.9 billion worldwide in 2014 IdeaWorksCompany, the foremost consultancy on airline ancillary revenues, and CarTrawler, the leading provider of online car rental distribution systems, project airline ancillary revenue will reach $49.9 billion worldwide in 2014. The CarTrawler Worldwide Estimate of Ancillary Revenue represents a massive increase of 121% from the 2010 figure of $22.6 billion. Earlier this year, CarTrawler and IdeaWorksCompany reported the ancillary revenue disclosed by 59 airlines for 2013. These statistics were applied to a larger list of 180 airlines to provide a truly global projection of ancillary revenue activity by the world’s airlines in 2014. The latest IdeaWorksCompany report reviews how the frequent flier business is positioned for change due to moves made by key players and their desire to revolutionize accrual methods. For many fliers, gone forever as of 01 January 2015 is the notion an economy class fare accrues miles on the basis of distance flown. Instead, the almighty US dollar will determine the miles posted to member accounts. “Revenue-Based Accrual as the New World Order” was released today as a free 15-page report and is available at the link above. The 2014 Loyalty Marketing Report series is sponsored by Switchfly, a global technology company that powers travel commerce and loyalty redemption solutions for leading travel, financial services and ecommerce brands. The annual CarTrawler survey of global airline ancillary revenue shows growth to $31.5 billion for 2013 ─ an increase of 1200 percent since the first such survey in 2007. IdeaWorksCompany researched the financial filings made by 114 airlines all over the world, 59 of which disclose ancillary revenue activity, to reveal that ancillary revenue reported by airlines reached $16 per passenger in 2013, easily surpassing global figures for profit per passenger. This press release describes highlights from this research and a top 10 list of best performing carriers in three categories. Value-oriented airlines dominate the results in the 5th annual Switchfly Reward Seat Availability Survey. Airberlin, Southwest, and Virgin Australia have placed within the top six slots for every edition of the reward survey since 2010. For 2014 airberlin and Southwest share first place with outstanding 100% scores; every flight queried in the survey provided reward seats at saver-style levels. The 25 carriers in the survey remained the same as 2013, except China Southern replaced AirTran as the latter continues to be absorbed by its parent Southwest Airlines. After 10 years, a new business model has transformed the world’s biggest industry. The business upheaval that began in the air travel industry a decade ago has now grown to span the globe, has brought economic vitality back to the world’s airlines, enabled the worldwide boom in low-cost travel, and granted consumers the gift of choice. The report identifies many key elements of this phenomenon, including: baggage charges, branded fares, subscription programs, high value customers, transparent pricing, and frequent flier program revenue. It’s no surprise the largest loyalty programs – American AAdvantage, Delta SkyMiles, and United MileagePlus – offer car rental and hotel rewards. The biggest surprise is posed by the high profile global carriers that don’t, such as Air China, Turkish Airways, and US Airways. Reward activity, survey results, and the prevalence of broad-spectrum rewards indicate they have become a “must have” amenity for frequent flier programs wishing to compete on a global scale. The report describes how better airline brands engage their top customers in a deeper relationship by going far beyond a basic selection of reward tickets and upgrade rewards.